On February 14th, 2018 the Safe Sport Act of 2017 was signed into law. The Act is Federal law and must be followed by all teams, organizations, associations, leagues, camps, combines, tournaments, trainers, etc. regardless of the sport. All sport related activities that involve youth up to age 18, regardless of duration, must comply. The law requires that all volunteers certify in a Safe Sport Act course and receive a certificate of completion. To be in compliance with Safe Sport Act law, TSYFL has bundled the Safe Sport Act certification course with the "Background Check". The bundle will be $24.95 and includes the background check and Safe Sport Act certification course. Once a volunteer passes the background check, a link will be sent for the online course. The Safe Sport Act requires the certification of volunteers to be completed prior to any participation with youth athletes. Any person who is volunteering in any youth sport that does NOT have the Safe Sport Act course certification is in violation of Federal law. This is a must watch from the 2018 USA Football National Conference. Make sure and watch Chris Carter (at 20:00) as he speaks on football. TSYFL 13U division in the San Antonio area Fall 2019 season will begin play October 19th. 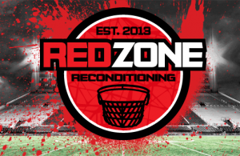 The later start from the rest of the league is to give those who are playing middle school football the opportunity to play select football and not interfere with MS practice or games. Teams who will be fielding a 13U should note this later start date. TSYFL is accepting teams for the 2019 Fall Season. For the 2019 Fall Season, in addition to the regular Texas Select division, we will also offer a "developmental division". Teams or orgs who feel they are not ready for the "select" level, but prefer the structure and offering of Texas Select can join the "Texas Select Developmental Division" (TSDD). Teams in the TSDD will follow a majority of the "select" level rules, yet play against only teams that are also in the development stage working towards moving to the "true select level" of Texas Select. 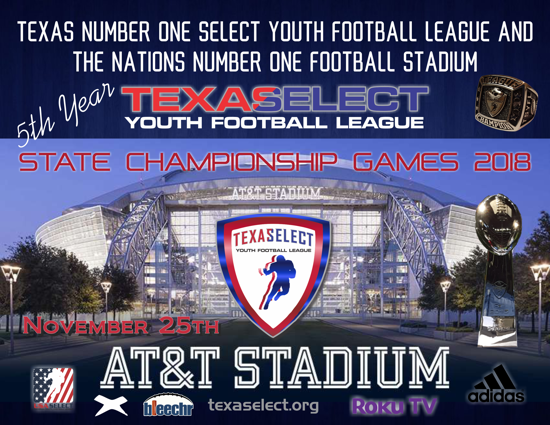 Texas Select YFL is the only "Age Based, No Weight Limit" Select league in Texas that plays for a league National Championship, not a "National Invitational Tournament" that even a team with a losing record can enter. Other leagues around Texas have what they call a "State Championship", though it is really just their "league" championship. Texas Select Youth Football League Inc. is a State member of USA Select National Youth Football League. USA Select National Youth Football League is growing with States across America. Teams should never be without Player Injury Insurance, moreover Facility Liability Insurance. Texas Select YFL allows organizations and teams to join Texas Select as an "Associate" so that they can take advantage of the low rates that have been provided to other Texas Select teams and organizations. The teams or organizations will still play and follow whatever league they belong to, but as an "Associate" member they will have access to the insurance. Policy is written by Wilson Sports Insurance Services, LLC. Willow Park, Texas. Flag age 4,5,6 is as little as $90 per team, tackle groups under 12 years of age is $220 per team, and 13 -14 is $290. $25,000 accidental injury with $250 deductible. Become an "Associate" of TSYFL for $25.00 per team. 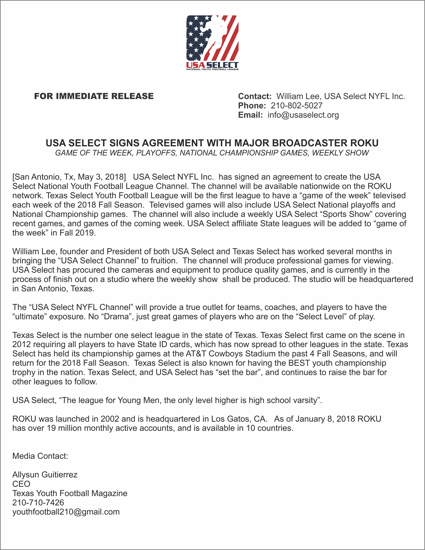 Fall 2018, TSYFL to be featured weekly on the ROKU Network. TSYFL adds competitive Cheer & Dance to 2018 Fall Season. Teams will vie at TSYFL State Competition, winners will advance to USA Select National Cheer & Dance competition. The Texas Select Youth Football League Inc. (TSYFL) is a service youth football organization whose purpose is to provide organized scheduling for member association/organization/teams and provide common age groups, and playing rules. The costs, fees or moneys are nominal to becoming a member. Each member association/organization/team maintains it’s respective autonomy over all internal decisions, fundraising, board of directors, etc. that may pertain to that individual association/organization/team. The TSYFL coordinates schedules, league rules and tournaments, and pending member approval. Each member association/organization/team involved with the TSYFL are Non-Voting members. A membership begins once registration is accepted, and is for the duration of the Season registered, and ends once the registered team/organization/association has completed regular season or playoffs, which ever comes last. RULES - Texas Select Youth Football League will follow the rules of the National Federation of High Schools (NFHS), USA Select National Youth Football League (USASNYFL), with additions, exceptions and clarifications as outlined in the TSYFL Variance and Supplementary Rules. MINIMUM REQUIREMENTS: 1) Teams must have player injury insurance in addition to facility liability insurance; 2) All players must have Texas State ID Card, or Military Dependent ID Card, or Valid U.S. Passport (Birth Certificates are not accepted); 3) Coaches must undergo background Checks; 4) Coaches must be Certified by USA Football, non-coaches/voluteers must certify with National Alliance of Youth Sports; 5) Teams must designate a Player Safety Coach and complete USA Football Heads Up Program; 6) Implement the USA Football Practice Guidlines; 7) Players must have a yearly Physical. These minimum requirements are equal to or greater than what Middle School and High Schools require. If your team or organization is willing to meet these minimum requirements, please send us an email. If your NOT playing towards a League National Championship, your just playing recreational backyard football.